Successfully Added Wholesale Mini Multimedia Projector with 2GB Internal Memory to your Shopping Cart. 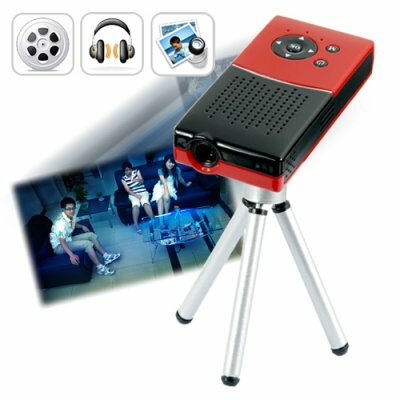 China wholesale mini multimedia projector with 2 gigabytes of internal flash memory. This mini projector is the best portable display solution for a wide range of social and business uses. With its small size allowing it to be easily carried in your bag, numerous options for loading and displaying media files, 2GB's of internal memory, and battery for powering it wherever you are, the CVJK-E42 gives you the benefits of a big screen projector without the hassle. This mini multimedia projector has two display options, either use the AV-IN cable to display video from external devices such as game consoles and DVD players, or load up media files into the 2GB's of internal memory (or your own microSD card) to playback with the multimedia player function built into the projector itself. When using the CVJK-E42 as an AV IN projector: Use the included RCA cable to connect your Video Game Console, DVD player, TV receiver, or other device to the input jack of the projector and then power it on to start playing your games and enjoying your movies in beautiful big screen glory! When using the built in media player function: Either load files onto the 2 gigabytes of internal memory or insert an microSD card. The CVJK-E42 plays an array of digital media file formats, including 14 popular download types including AVI, RMVB, and DAT. Enjoy watching videos in a cinematic large projection display up to 42 inches in absolute clarity and brightness, no matter where you are, your own living room or a hotel bedroom! Better still, to make an even more enjoyable entertainment experience you can either use the units built-in speaker or your own favorite earphones. This is a must have item if you are a media oriented individual or business traveler, and is in-stock in our warehouse right now. However, we have a VERY LIMITED STOCK of this item! Place your order now so you can start better utilizing your space and time with this ultra convenient mini-sized, max power projector exclusively from Chinavasion! AV IN for Game Consoles, DVD Players, etc. Free bonus tripod included - while supplies last! Bonus tripod included FREE! The tripod is capable of rotating through an angle of 360 degrees. This will enable watching TV on walls and ceilings while lying in bed. When used for home entertainment purposes this unit can also be connected to a huge range of standard A/V video sources such as the Wii, XBox, PS2, Dingoo A320, MP3/MP4 players, DVD, DV cameras, etc. All projectors should be used in low light, and for best viewing experience use the mini projector in no light. The mini projector is a simple plug and play device, just connect it to your computer through the USB cable, and you will instantly be able to transfer your media files. The life of the bulb for this projector is, on average, 5-10 years, depending on usage type. If there is a problem with the bulb during that time, please contact us.